It's a quartz-powered wunderkind created with the globetrotter in mind. Summer in Rome is notoriously punishing but the heat and humidity are rendered a mild inconvenience in the invite-only Longines viewing box. As title sponsor and official timekeeper of the Longines Global Champions Tour, the watchmaker commands the best view in the house, facing the arena where the fifteenth leg of the international show jumping competition will commence. Ringed by 60 larger-than-life classical marble statues depicting various sports, the Stadio dei Marmi is a sumptuous complex in itself but the day’s festivities demands an atmosphere of equal merriment. A colourful carousel greets guests at the entrance, vintage cars are parked along the dirt driveway, men in heavy gladiator outfits march to a rhythm only they can hear and stands circling the showgrounds do brisk business in snacks and drinks. The occasional pet dog woofs a greeting and shorts and light shirts are de rigueur among the spectators. The Longines box, however, dictates an elegant dress code. The jackets it imposes on gentlemen are quickly doffed and waiters bearing wine find themselves immensely popular with guests. This is put on hold when an exclusive proposition is extended to us: the chance to tour the arena itself to see the course up close. Jumping is among the more complex equestrian events, demanding skill, synchronisation and trust between horse and rider. The pairs are judged for their ability to cleanly complete a course within an allocated time, with marks deducted for faults such as knockdowns (knocking down the bar of a hurdle). Riders who succeed in clearing the course perfectly then take part in a jump-off — the winner is the one who scores the highest points by finishing the course cleanly in the shortest time. On the ground, the enormity of the feat seems much clearer. It is not the height of the hurdles that matters but the distance between them. We cling to a corner so as to not get in the way of the riders who are canvassing the course, deciding how many strides their horses would need between jumps to pace them correctly, with some requiring tricky half-steps to complete (one horse stride is equivalent to 12ft). The colours of the hurdles indicate difficulty levels — paler hues are deemed more challenging as horses see bold colours easily. The first of the 35 riders urges his horse out. It clears the early hurdles but then clips a bar with its hoof and, upon landing, promptly tips its rider over its head. The next couple of pairs clear the course effortlessly, setting the tone for sleek performance and precision. Crowd favourite Alberto Zorzi knocks over a bar to loud groans; the crowd is equally emphatic in misfortune as it is in victory. Qualifiers for the jump-off are announced. 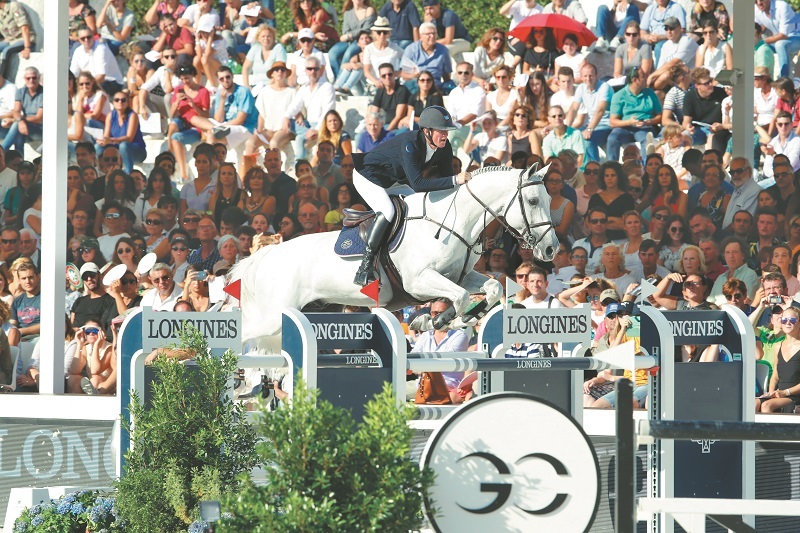 The energy level in the stadium rises significantly as a succession of riders shave seconds off the previous rider’s time and the momentum continues until British show jumper Ben Maher enters on his horse, Explosion W. His time of 37.45 seconds places him firmly in the lead, where he stays until the jump-off is concluded. On the podium alongside runners-up Henrik von Eckerman and Jos Verlooy, he pops open a bottle of champagne to cheers from the crowd and receives a commemorative timepiece from Longines president Walter von Känel. The victory also earns him one of the last golden tickets to the Longines Global Champions Tour Super Grand Prix in Prague in December. Känel and the winners join us at the Longines box where, as the sky darkens with the late sunset of summer, the buffet table is being laid out with every manifestation of pork imaginable — sausages, prosciutto, roast with crispy skin and crackling — along with salads, cakes, sweet melons and figs. Guests feast heartily as the arena transforms into a stage. Performances go on late into the night, spanning flag throwing, which dates back to medieval times and is now a rare Italian tradition, to routines that flaunt man’s ancient relationship with horses through dances and dramatics complete with swords, spears and fire. It is a couple of hours to sundown when the same international group of guests gathers at La Lanterna Di Fuksas the next evening. Located at Via Tomacelli, a bustling street flanked by boutiques and the occasional gallery, the building is unassuming from its sidewalk entrance. An elevator takes us to the rooftop event space where all the fuss surrounding the venue suddenly makes sense. 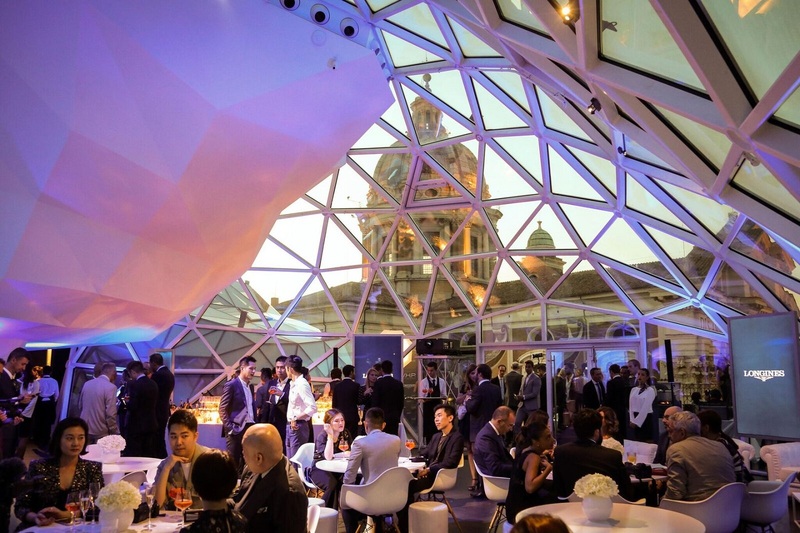 Crafted (and that is the precise word for it) from glass and steel, the dome encasing the space is a geometrical signature by architect Massimiliano Fuksas — an explosion of sculptural forms that burst across the terrace and down one side of the building. The triangular steel outlines cut surreal shadows on the floor while the glass showcases the changing sky, breathtaking dome of the basilica church Sant’Ambrogio e Carlo al Corso next door and bougainvillea-filled balconies of neighbouring buildings. The entire effect is a marvel of light and colour, both natural and artificial. The lighting indoors plays off the mood of the sky, suggesting the pastel hints of sunset before the phenomenon occurs and then diving into the deep hues of night as darkness descends. Beneath the sculptural glass dome of Lanterna Di Fuksas, as the sky dramatically throws off the last vestiges of the day’s sun, Känel and Longines vice-president Juan-Carlos Capelli unveil a timepiece of similarly impressive architecture and play of light. The Conquest V.H.P. GMT Flash Setting is a quartz-powered wunderkind created with the globetrotter in mind. First, the aesthetics: versatility comes in the form of steel or black PVD constructions measuring 41mm or 43mm. The traditional three-handed hours, minutes and seconds display is equipped with the date and a second time zone marked by a thin imperial arrow hand, with “Home Time” and “Travel Time” symbols stamped at 10 and 2 o’clock respectively. Dials are silver, blue, black with radial guilloché or carbon fibre, while straps are fashioned from steel, black PVD or blue or black rubber. What truly makes this tick, however, is it unconventional time zone mechanism. Travel time can be adjusted manually through the crown or using the nifty light technology Longines has developed. The Flash Setting system, as it is called, sets the watch to the relevant second time zone using flash pulses from a smartphone without requiring external connections such as Wi-Fi or Bluetooth. Instead, the conversation between smartphone and timepiece relies on a system akin to Morse code to communicate. 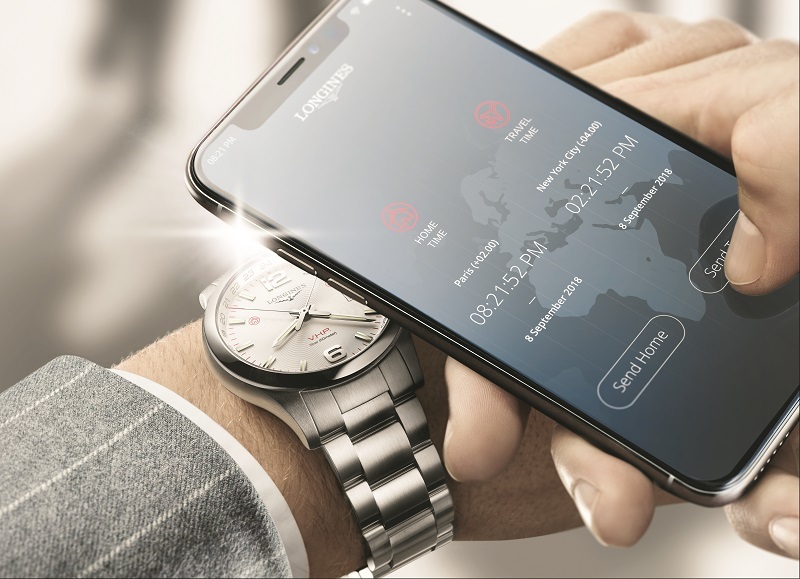 Users merely have to launch the customised application on their smartphone and select a time zone from 40 city references. The smartphone’s flash transmits information via light sequences, similar to old-fashioned dots and dashes, to a tiny aperture on the number ‘1’ on the 12 o’clock index on the watch’s dial. The sensor absorbs the information and the watch now contains both home and travel times. Users merely have to push the crown to switch between the two, and the seconds hand quickly jumps to the home or travel time symbols at 10 or 2 o’clock so you know which time zone you’re looking at. Seeing this work is similar to sitting in on a magic show. Upon picking your travel city, you merely hold your wrist beneath the flash sensor of your phone and the hour hand glides across the dial as if by its own volition. The information is indefinitely retained so if you regularly travel between two cities, you can easily interchange time zones upon landing. This dismissal of connective technology asserts that the timepiece can by no means be called a smartwatch — it is assuredly 100% analogue, in keeping with the watchmaker’s identity as a traditional Swiss watchmaker. And the retention of the crown for manual adjustment of the second time zone means that even in a future in which today’s smartphone technology is rendered obsolete, the timepiece is still relevant, a claim digital watches cannot make. 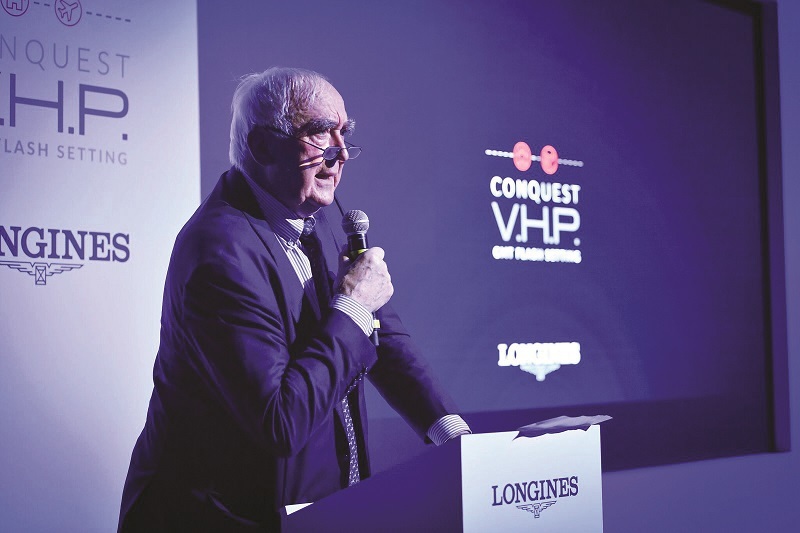 Precision — the same quality that underscores Longines’ role as official timekeeper of demanding equestrian events — is a crucial namesake attribute of the V.H.P. or Very High Precision family. The Conquest V.H.P. GMT Flash Setting houses a cutting-edge calibre that guarantees ultraprecision with just a five-second variation per year, a perpetual calendar that will require no manual interference of date accuracy until 2399 and a Gear Position Detection (GDP) system that resets the hands after an impact or magnetic field exposure. Just how carefully our itinerary has been curated becomes evident here — every single experience was designed to highlight facets of Longines as a brand and its latest reveal, our reason for gathering in Rome, the eternal city. As watchmakers get increasingly creative with elaborate bells and whistles, there still exist purist manufactures who embrace the traditional tenets that have sustained the industry for centuries while creating for the future. 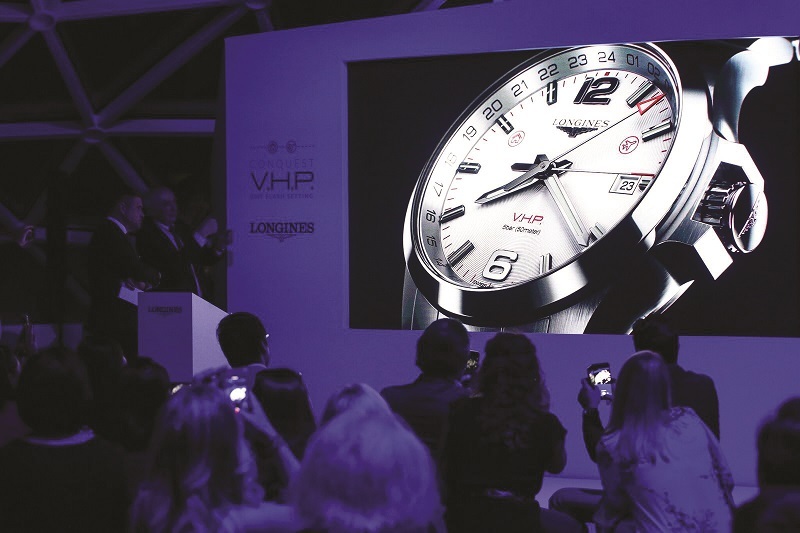 It is not in Longines’ nature to chase flash-in-the-pan trends or think only about today. Just as the relationship between man and horse is eternal, just as steel and glass are enduring materials and light is a perpetual source of illumination and wonder, so too are precision and elegance timeless qualities that will always be of value. This article first appeared on Oct 22, 2018 in The Edge Malaysia.